In the final analysis, most movies, regardless of how much money they spend on action set pieces and special effects, are about relationships. This is just as true for the movies of the Marvel Cinematic Universe as they are for anything else. And, since the MCU is largely populated by men, that means that most of these relationships are between guys. That means that when Joe Russo says Captain America: Civil War is a love story, it's going to be non-traditional one. What’s fascinating about the Cap-Bucky story as well is it’s a love story. These are two guys who grew up together, and so they have that same emotional connection to each other as brothers would, and even more so because Bucky was all Steve had growing up. To be clear, he is simply talking about the love between two lifelong friends. The relationship between Steve Rogers and his friend Bucky has been a significant part of the entire Captain America story, dating back to the first film. They’ve known each other for pretty much their entire lives. Director Joe Russo tells Empire that this lasting relationship is really what Captain America: Civil War is all about. When we first meet Steve Rogers in Captain America: The First Avenger he’s a 90 pound weakling. His friend Bucky Barnes is the only reason that he doesn’t spend every day getting beaten up. He idolizes his friend and wants to follow in Bucky’s footsteps. It’s that feeling that leads him on the path to becoming Captain America. Then the two get a chance to work together as equals before Steve loses Bucky in battle. When the two cross paths again the roles are reversed. Bucky Barnes is the one who has been abused, having been turned into the Winter Soldier, and Steve feels a responsibility for the friend that helped him for so long. 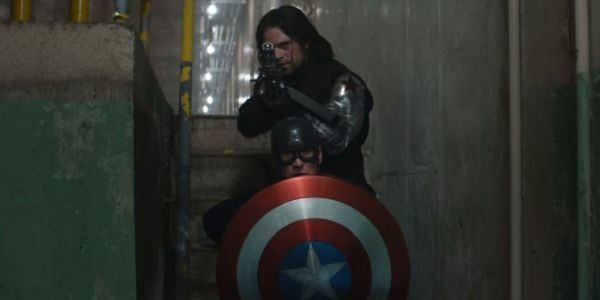 Cap feels guilty for not doing more to help Bucky, which brings us to the events of Captain America: Civil War. The relationship between Chris Evans’ Steve Rogers and Sebastian Stan’s Bucky Barnes has to be the strongest in the film. Cap’s desire to protect his friend is one of the major reasons that he separates himself from his other major relationship, with the Avengers. Ultimately, when forced to choose, Steve Rogers will choose his oldest friend. While this relationship is strictly one among close friends, expect the internet to go slightly bonkers over it. The greater implications of the Steve-Bucky relationship, known as "Stucky" in some corners of the internet, (I’m not the only one with these friends am I?) is a favorite pastime among a certain Marvel fans. Either way, we look forward to the next chapter of the MCU and the next chapter in the relationships of all of our favorite characters. Captain America: Civil War will be in theaters May 6.